Bright apartment with idiosyncratic floor plan and modern facilities. Generous to life on holiday for 2 persons, with room for 4 people who understand each other. Our apartment in Neuenkirchen offers everything for a relaxing and relaxing holiday in the beautiful Lüneburg Heath. 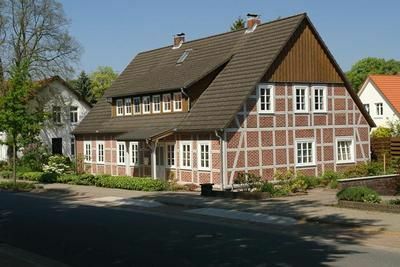 The apartment is located on the upper floor of a representative old half-timbered house. The house was built in 1895 and is family owned since 1899. Since then it has been rebuilt many times. With the vacation apartment "ArriveUndBleiben" completed in 2015 we are now continuing a tradition. In our house since the 1930s "Sommerfrischler" have been housed. The apartment offers you the conveniences of modern life without crushing the dignity of the old house. It impresses with its idiosyncratic floor plan. The rooms offer a variety of visual references, both inwards and outwards. The numerous windows let in a lot of light, so that even in bad weather no gloom comes up. The self-contained apartment has a separate entrance and a private parking space. The rest of the house is inhabited by us. Behind the house is the garden, where you can sunbathe or barbecue after the weather and your heart's content. Of course, garden furniture is part of it. The historic main entrance of the house will not let you stand in the rain. It is protected by a canopy today. The hallway provides ample space for your jackets, coats, shoes and luggage. At the old staircase, the ravages of time had been too gnawed, so we have replaced them with a new and more comfortable. The bright gallery is a living and sleeping area. The high-quality sofa bed can easily be converted into a comfortable double bed at night. With screens you can personalize your intimate sleeping area. Pleats and curtains on the windows block disturbing light. A fly screen keeps out pest spirits. There is a fully equipped modern kitchen with a cozy dining area. The windows overlooking the garden let in plenty of natural light, while plissees provide privacy. In the kitchen are ready for you: large fridge with freezer, ceramic hob, oven, extractor fan, dishwasher, coffee maker, kettle, toaster, blender, scales, dishes for 8 people, glasses, bowls and much else not mentioned. The spacious bathroom has been completely redesigned. The floor is made of a vinyl flooring and flatters your bare feet. The skylight can be darkened by a roller blind. Equipment: WC, washbasin, shower (75x90 cm) with shower screen, hair dryer, make-up mirror. The studio is the wonderful central living space of your apartment. It is generously divided by exposed beams, which make the character of the half-timbered house come alive. The middle part is designed as a cozy living area. The leather sofa invites you to relax, unwind and linger. In the sleeping area, each side of the bed has its own "entrance". The double bed has a sleeping area of ​​160x200 cm with separate mattresses and individually adjustable slatted frames. In the sheltered atmosphere under the sloping roof and delimited by the beams of the framework, cuddly and restful nights nothing stands in the way. Darkening pleats make the whole day on request the day for the night. Equipment: Fly screens, blackout plissees. Satellite TV with USB port, radio with Bluetooth, Bluray player, games and books. Final cleaning: once per object costs in the amount of 35 EUR (obligatory). Cot: to rent once per object for 20 EUR (optional). Electricity: per object and day included in the price (compulsory). Schöne Ferienwohnung mit allem was man braucht! Die Ferienwohnung war von der Größe her optimal für zwei Personen. Die Austattung lässt keine Wünsche übrig. Gute Lage für Freizeitaktivitäten. Einen Stern Abzug wegen der etwas Lauten Straße. The Schnuckendorf Neuenkirchen lies in the Lüneburg Heath, in the triangle between Hamburg, Bremen and Hanover. The apartment is centrally located in the village, in nature there are still a few steps, your car can be quiet times leave. The shops, doctors and pharmacy, the natural pool and the Kunstverein Springhornhof are within walking distance. Neuenkirchen is surrounded by meadows, fields and forests, perfect for hiking and cycling. Away from main roads, it goes by bike to Soltau, Schneverdingen or Visselhövede. Neuenkirchen is also an ideal place to from here to visit the theme parks around: Heide Park, Weltvogelpark Walsrode and the Serengeti Park. Cot (once per object, costs EUR 20).